(Surf City), Victoria, Australia. Circa 1986! Forming the union which later birthed Pucara Alpaca Stud (Australia) then Pucara International. 160 acres over looking the beaches of the Victorian "Surf Coast". Where Al designed and built mostly upscale holiday houses for people from Melbourne and those who worked in the local surf industry (Quiksilver and Rip Curl, and Ugg Boot Company, all started in the local town of Torquay). Jude taught at the local primary school. But what to do with all that land? This is Pt. Addis beach, a 5 minute walk! We had started on 5 acres but alpacas help provide the means to afford our Pt Addis property. The article that caused it all! That says at the top of the article in my hand writing..."Sell Johanna ... buy 'em....Yow..."! After years of hard toil we had purchased (traded with a client of Al's in lieu of "work done" a gorgeous property in south west Victoria overlooking the famous Johanna surf beach. Solitude, the raw Southern Ocean and 25 acres of heaven perched above God's own country. We did sell it to buy alpacas! Those first alpacas not only won our hearts but were productive financially giving us the means to throw ourselves headlong into the industry. By 1997 we were full time! Our first show...The Melbourne Sheep and Wool Show...maybe 1992? Jude with a Janis Joplin look! That is Roxy with a Reserve Championship ribbon. One of four alpacas purchased from the Haldane brothers from the famous Purrumbete herd. So it was that alpacas put us here and we were motivated to pursue this thing full time. Even just after five years in the industry alpacas had opened so many doors and our sights were set on what the world had to offer. Ideas and risk had a builder and a teacher astral travelling!!! WE HAD TO HAVE THEM! Due to import restrictions because of disease Australians could not import from Peru, we heard they were in the US from our mentor Roger Haldane, so with no money and big dreams we went looking. This was starting to look like an addiction! And off we went to the 2P Peruvian Import at Charlevoix, Michigan. Good heavens. We met Don Julio Bareeda, Mike Safley, Don and Julie Skinner, Greg Mecklem, some guy who started Apple!! !, Mike Tierney, Bill Barnett, Anthony Stachkowski....what an eye opener. We were totally intimidated. The money moving around was shocking! In amongst we kept coming across Don and Julie Skinner. We were always looking at the same animals. A relationship started then that has lasted a good many years and we purchased our first Peruvian from them, Peruvian Drambuie. We ended up partnering in Peruvian Hemingway, Peruvian Don Julio and others that we forget! In 1995 and 1996 Peruvian imports we went to Peru to help select for them and us. In the end because Peruvians had to reside in the US for 12 months before leaving for Australia we swapped our direct Peruvian imports from Peru for Peruvians or their offspring that had resided in the US for 12 months from several US breeders. In 1997 we imported 60 alpacas from the US into Australia, some owned by clients we had chosen for. Some were for sale to pay for the shipment. We became experts at financial creativity! This shipment included 40 suris from Castle Hill farm and Alpacas of America. The foundation. Crikeys, I can even see the dumpy hotel we stayed in near the bridge in the background pic of Charlevoix. We decide at this event if the alpaca market ever dulls in Australia we wanted to raise alpacas in the US. Of course we did not entertain the idea that it would ever happen. Now here's a giggle! Pucara meets Snowmass. Charlevoix, 1994. Jude leading Pluro, Legend, Drambuie and Don Julio just after the import. Our import suri offspring hit the big time! At first we'd sought out the best huacayas we could find. But after Al visited Alpacas of America and saw a field of full fleeced suri yearlings from white through to black and gray it was on! We had fallen in love with suris. "Curtains of Silk." 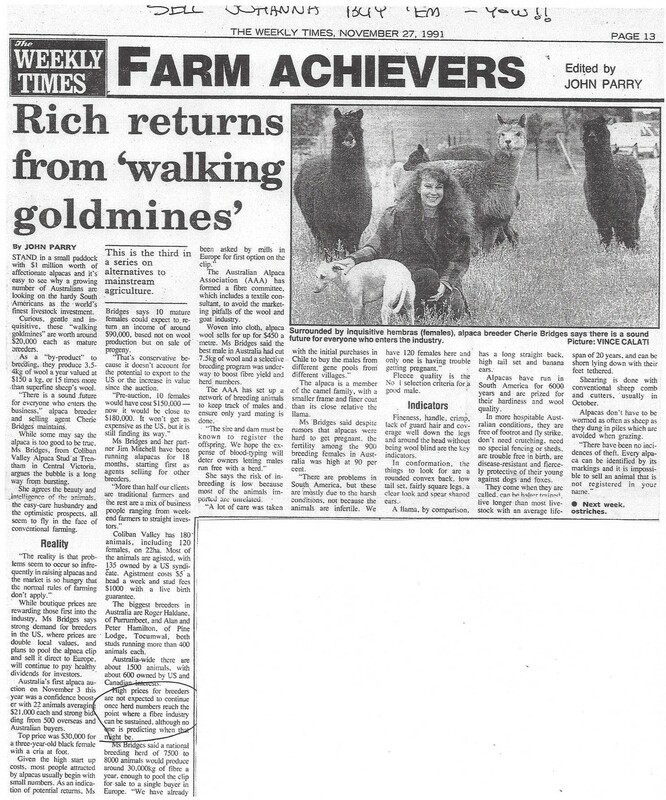 For several years we pushed suris and then in 2000, and again 2001 Mike Safley encouraged Al to come over to the US to run North West Alpacas marketing and sales. Soon they form the Studmaster program and Ideal Alpaca Community and before you know it, Jude is over there (here) managing the farm. The Aussie Pucara farm was being well looked after by our manager. By 2004 Al and Jude went in search of a property for themselves. They found 103 acres with all the facilities to get alpacas right onto the property without too much fuss. Huge barns, incredible pasture, a comfy house and irrigation rights! Perfect. Right in amongst the wine growing area of the Willamette Valley, Oregon. By October 2004 we were settled in at Muddy Valley. Almost straight away we started to import the descendants or originals of the US Peruvian imports we had taken to Australia back in 1997. That included Pucara Kahuna. We were able to do that becasue we had several full relatives in Australia because of Embryo Transfer being allowed. We had kept them as a "closed" herd breeding only US registered animals to maintain their ARI staus. It comprised mostly of white suris. We had never intended to show in the US because of Jude's judging but competitors called us out. So we showed. We have bred from our own studs and dams alpacas that have won upwards of 15 Futurity Herdsires of the Year, in light and color, and sometimes both in the same year! Coming onto 26 years now total and 16 years in the US alpacas have opened up the world to us. Trips to Peru, Canada, New Zealand, the UK, Europe. Exports to Canada, the US, New Zealand, the UK. Now with the approval of Embryo Transfer in the US we have birthed down the first ET cria in the US and are assisting breeders nation wide with ET programs. Their first day in the US! First and second in the Get in white and color, sire and grandson! A small sampling of our US success. Embryo Transfer is a first for the US industry. And that is Jude with the first embryo that can be registered with AOA. And thats the first embryo Jude has personally flushed. That cria is now born and running around the pastures of Pucara International at their Muddy Valley paradise! Now Jude and Al along with Natasha James are supplying the means via AET LLC for other breeders to apply ET to their breeding prgrams.